If the glitzy modern engagement rings aren’t your thing, why not think about going for something classic and in the style of an Art Deco piece. What does the term Art Deco mean in terms of Jewellery? The Art Deco period is in fact one of the most popular and lasting design periods in the history of jewellery. This period of time spans from the early 1920’s through to 1935, but in fact its relevance was so prominent that it continued to influence styles well into the 1960’s and today. Art Deco jewellery can be noticed by its geometric form and extremely bold colours. Diamonds were extremely popular during this period and were often teamed with bright rubies, sapphires and emeralds. One of the most defining signatures of this period is the use of black onyx paired with white diamonds. Some of the most famous jewellery house in the world such as Cartier, Tiffany and Van Cleef & Arpel are thought to have created some of their most iconic work during this time period and in this style. This style of ring is definitely the most popular style of an antique ring. This type of engagement ring is most commonly known for its geometric patterns, but can also be seen in the styles of African and American Indian influences. Rings tends to be old mine cut, with new styles of shapes and calibre making them stand out from today’s pieces. The most common gems used in these rings are diamond, emerald, sapphire, ruby, black onyx, crystal, ivory, jade, mother of pearl. The types of metal used are platinum, white gold and silver. This Tiffanys ring shows what is classic of Art Deco style rings. 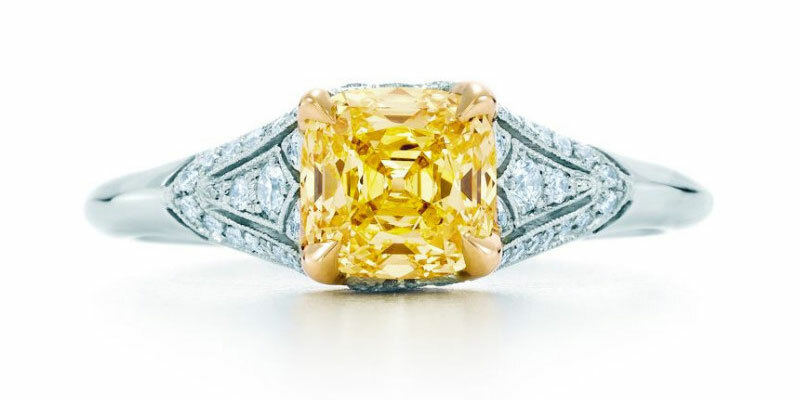 The vibrant yellow diamond is said to capture “the majesty of the sun’s golden rays” in a ring inspired by designs from the Roaring Twenties. This ring is made of platinum and 18 carat gold, the square antique yellow diamond is 2.31 in carats, and the total amount of carats is an impressive 20 carats. And the price for such a ring? Oh just a modest $98,000 dollars. 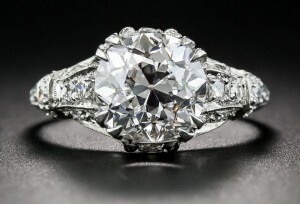 Another incredible example of the style of Art Deco engagement rings can be seen in this classic ring. 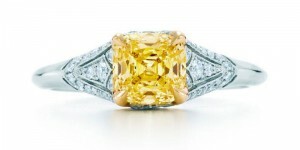 This high-colour, spectacular, European-cut diamond, weighs 3.14 carats. The stone crowns a, platinum and diamond mounting all around with small single-cut diamonds set in geometric settings. This incredible ring set you back a modest €100,000. If you’re after something in the Art Deco style without the hefty price tag often associated with it, we here at Volatire Diamonds will have something to cater for your ever needs. Call us for a consultation to see our extensive range of breath taking rings. This entry was posted in Buying Engagement Rings, Diamond Education, Featured, Interesting Facts About Diamonds and tagged art deco, black onyx, white diamonds.